We piled a whole bunch of mattresses under her and four or six (I can’t remember… it was back in 1992) guys held her up, while a bunch of folks taped her. After we had a bunch of tape on her, then we reduced the number of folks holding her, but didn’t pull most of the mattresses out until we were done. She was a volunteer and the whole thing was a lot of fun — she said that she’d happily do it again, though we didn’t. It was one of those persistent college myths. We’d all heard it over the years: You’d wake up one morning and drag yourself down to the cafeteria for breakfast, only to find some poor sucker duct taped to the ceiling of the waiting area outside of the cafeteria. Usually it was some obnoxious guy who had been unwillingly carried down there, held to the ceiling, and taped in place… to spend the night waiting for the morning breakfast crowd to find and free him. My friend, Steve, and I got curious about this. No one we’d ever talked to had ACTUALLY SEEN a person duct taped to a ceiling. Everyone had heard the stories, but… no proof. Was it just one of those urban myths? Or could someone actually be duct taped to a ceiling? Steve and I were trouble. Don’t get me wrong: we were both very good students, both nice guys (he much more so than I), neither of us getting into literal trouble, but… we liked to organize things. And we liked to have fun. We’d done the obligatory test of how many people you could fit into a phone booth. Twelve in this case, although we really weren’t all that crowded in there. Now we needed to find out about duct tape and ceilings… We got ourselves a volunteer. Yes, in all of the stories, the duct tapee was not a volunteer. But, like I said, Steve and I weren’t that much trouble. Little Tammy – a fairly spirited freshman who lived near us and, most importantly, a fairly SMALL woman – volunteered. Steve and I spread the word: we’re going to duct tape Tammy to the ceiling in Loose Hall. This kind of word spreads quickly! The appointed hour arrived and Steve and I found ourselves with what may have been the largest Loose Hall event for that year, completely unofficially! More than fifty people came to help us duct tape little Tammy to the ceiling. We dragged a bunch of mattresses out into the hallway to lay beneath her, and got one bunch of guys to hold her up while another bunch of guys taped her in place. Should anyone get any ideas, the very large pile of mattresses is key. Also important is that she wear long-sleeved clothing (pants and top), so the duct tape doesn’t stick directly to her. We used four of the mongo duct tape rolls. I remain convinced that two large rolls, or less, would have held her. But we were being conservative. Eventually, we had to let go of her and find out if the duct tape held. It did. She didn’t move one bit. We left her up there for 10 or 15 minutes, with much joking about all of us walking away. Of course, we did not. After a bit, we took her down, expecting to remove most of the paint from the ceiling in the process. (We’d already told the RA that we would pay to repair the ceiling.) Much to our surprise, only one very small piece of paint came off with her. In case you’re wondering, Tammy had a great time. She even volunteered to do it again. 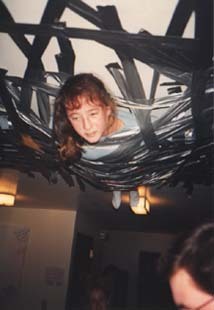 So there you have it internet, the mystery is solved, we all now know how to duct tape a girl to the ceiling. Thank god its solved, I can now move on with the rest of my life, thanks Kitta! I am somewhat jealous of that girl. It’s a one-of-a-kind experience it seems. Also I’m sorry to hear about your allergies. I hope they imrpove. I know how irritating they can be! Obviously and unfortunately. Haha, it’s amazing what boredom & the imagination can lead you to think! Let’s organize an australian version !!! Sure. I’d let a guy called Herman duct tape me to the ceiling. o.O;; That just goes to show how strong duct tape is… I’d have een scared she’d fall! Now that we have a volunter, the next step is finding location ….. hmmmm …. Kinda reminds me of the time we broke into a friend’s dormitory room and Super-Glued his furniture to the ceiling. wow what can i say a girl ductapped to the cieling…”its awsome” would so be an understatement!!! They tried this on an episode of Mythbusters once – even left them there until they fell down to see how long the duct tape could hold them! It was ages ago so I can’t remember all the details, but since the series is reasonably popular (in the UK and US, at least) you can probably find it somewhere online if you’re interested.